You often hear me harping on the dangers of too much debt, and I keep my eyes peeled for significant work that backs up my concerns. In my recent Outside the Box, good friend Dr. Lacy Hunt of Hoisington Investment Management gave us more ammunition to take on those who just don’t seem to get that the endless piling up of debt is not a sustainable way to run an economy. The most striking feature of the US economy’s performance in 2015, according to Lacy, was a massive advance in nonfinancial debt that kept the economy stuck in the doldrums of subpar growth. Lacy also points out unfavorable trends in each component of nonfinancial debt. Last year business debt, excluding off balance sheet liabilities, rose $793 billion, while total gross private domestic investment (which includes fixed and inventory investment) rose only $93 billion. Thus, by inference this debt increase went into share buybacks, dividend increases, and other financial endeavors…. When business debt is allocated to financial operations, it does not generate an income stream to meet interest and repayment requirements. Such a usage of debt does not support economic growth, employment, higher paying jobs, or productivity growth. Thus, the economy is likely to be weakened by the increase of business debt over the past five years. 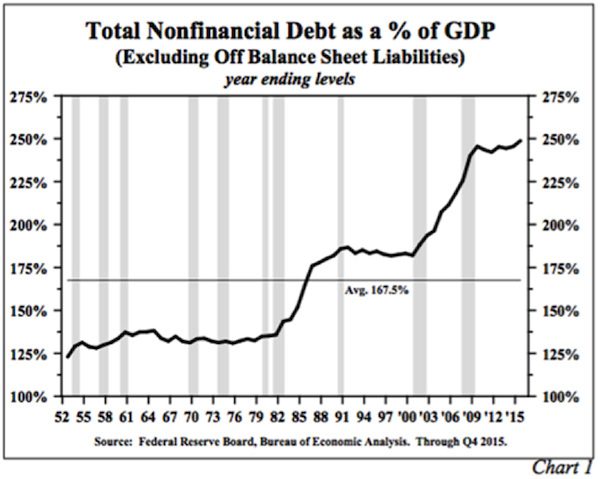 US government gross debt, excluding off balance sheet items, gained $780.7 billion in 2015 or about $230 billion more than the rise in GDP…. The divergence between the budget deficit and debt in 2015 is a portent of things to come. This subject is directly addressed in the 2012 book The Clash of Generations, published by MIT Press, authored by Laurence Kotlikoff and Scott Burns. They calculate that on a net present value basis the US government faces liabilities for Social Security and other entitlement programs that exceed the funds in the various trust funds by $60 trillion. This sum is more than three times greater than the current level of GDP. Total debt … increased by $1.968 trillion last year. This is $1.4 trillion more than the gain in nominal GDP. The ratio of total debt-to-GDP closed the year at 370%, well above the 250–300% level at which academic studies suggest debt begins to slow economic activity. The Federal Reserve, the European Central Bank, the Bank of Japan, and the People’s Bank of China have been unable to gain traction with their monetary policies…. Excluding off balance sheet liabilities, at year-end the ratio of total public and private debt relative to GDP stood at 350%, 370%, 457% and 615%, for China, the United States, the Eurocurrency zone, and Japan, respectively…. The debt ratios of all four countries exceed the level of debt that harms economic growth. As an indication of this over-indebtedness, composite nominal GDP growth for these four countries remains subdued. The slowdown occurred in spite of numerous unprecedented monetary policy actions—quantitative easing, negative or near zero overnight rates, forward guidance and other untested techniques. Now think about this, gentle reader. We’re digging a great big hole that is likely to cave in on us before we manage to claw our way back out of it. We need to “war game” how we respond in our personal lives. That is going to be a big focus of my letters in the coming months.